john: Hey, Casey. What are you doing? casey: I'm doing some math work, john. john: Would you like some help? casey: Yes, I would. My first question is n+3-5n+12. The answer I got is -6n+15. casey: oh i see, i have trouble with another question it 's ,2 + 4 bracket 3n+8 bracket. john: what do you think the answer is ? casey: i think it's 12n + 10 .
john: that's wrong it is 6n + 32.
john: Well i got to go, nice talking to you casey. casey: alright , bye john. Over the winter break, Mr. Harbeck assigned an assignment. He told us to do something good for one person and in turn ask them to pay- it- forward. The goal is to make a signifance in someone's life. Karen and I teamed up to work on the project together. Plus, this would be a great opportunity to brainstorm with another person. We decided to assist Karen's Godfather in taking care of his daughter, Dana. We both loved kids and babysitting. We knew Karen's Godfather and wife were overwhelmed with deadlines and the readiness of Christmas. We told Karen's god father that we could sit for Dana while him and his wife have a day to themselves. They agreed to this and we had arranged to baby-sit Dana on December 23th at Karen's house. When we babysat Dana, we did not know how she would react to us. Her cousin and her friend taking care of her without her parents, was a dramatic change for her. But luckily for us she got used to this arrangement and got used to being around us for a few hours. After our babysitting session, we felt kind of tired and at the same time contented that we did something good for someone to make a change in their life. Later, when Dana's parents came to pick her up, they asked us how to pay us for all of our hard work. We told them instead of paying us money, they could pay- it- forward. They were suprised that we rejected the thought of payment and confused about what paying- it - forward meant. We simply told them that paying it forward meant that you had to do a good deed for someone-else and in turn that person would do a good deed towards someone else. They were first suprised on what we wanted in return, then they understood what they had to do to pay us back. And yes, one person can make a difference. Whether your big or small, old or young, rich or poor everyone can do their part and make a change. If everyone does a good deed then passes it on, more and more people will have the passion to do a good deed. Everyone can be a good samaratan and make this world a better place. Over the winter break we were asked by our teachers to " pay it forward". Which means to do a random act of kindness and not ask for anything in return. So I did my brothers chores, and visited my Nana ( grandma). I also helped re- do my basement over the break . In the next few paragraphs I will explain how I did this! So first I shoveled my 2 walk ways. I wore a hat, mittens, and a heavy jacket because it was really cold out. The first time I shoveled my sister helped me, because it wasn't that cold out. But the second time I shoveled was today and it was really cold out. But I didn't care because I was helping my brother out by shoveling for him. And I was also helping the mail woman because she can't deliver our mail if the our path has snow all over it! So here is a picture of me shoveling. I also helped my parents with our basement. First I helped sand the walls in basement. Then we needed to clean up all the dust down there and vacuum everything. After that my sister and I had to clean all the walls with warm soapy water. That really hurt my arms . The next day we were ready to paint. I don't really know how to paint, so I only did some painting in my basement . After we painted , there was MORE cleaning! I had to crawl on the floor on a towel and clean up any paint that fell with a rag. Gross ! Sorry I don't have a picture of me doing this! One day after I was done cleaning down stairs. I thought of my Nana and I thought she would like it if I would bake her cookies on a cold day. So my sister and I made her some oatmeal and pecan cookies. After they were made I phoned my Nana and asked her if it was okay if I could bring her something. And that it was a surprise! I packed the warm cookies in a container and my sister and I walked over there. She asked us to come in and talk. So we did, she told me how happy she was for thinking of her and that she loved me. Which is normal because she's my grandma. 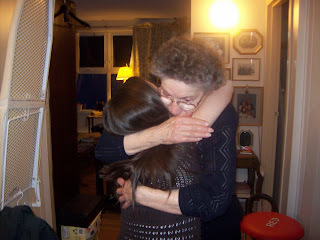 When we came home I felt really happy because all I could think of was that my Nana was happy because I thought of her. And that I did something nice for another person. Even if it was my grandma and not a stranger. For my last act of kindness I volunteered to serve lunch for other people. The people I served were ones I know from my religion taking a 2 week course . So they weren't complete strangers :) Any ways when I got there I helped prepare the plates of food for the lunch. By the way we had Greek food it was really good! ^^. When the people came out , the other severs and myself would ask them if they would like any thing to drink or if they were enjoying the meal. This was a lot of fun because I got to catch up with a few friends that I haven't talk to in awhile. And when they were done eating they clapped for us, because we did a job on the food! Which was nice because they really appreciated the meal and the kind act. Over all it was really fun. Behind me is the place I severed at. Can one person make a difference? Well yes they can! Just look at what all of the grade 8's have done. I'm sure that everyone who received that act of kindness , had a better day because of it. This year grade 8 students at Sargent Park school were asked to "Pay it Forward" over the winter break. Paying it forward means to do a random act of kindness "just because" and instead of getting paid back you tell the person that you helped to "pay it forward" (doing another random act of kindness just because). For pay it forward I decided to give to the Salvation Army because it helps those who need it the most. So, I did that and I was done but I still wanted to do some more. Eventually my dad had to snow blow our driveway (we have a snow blower and he uses that instead of a shovel) I decided to give him a hand by shoveling the walkways to our house as my second random act of kindness. Once I was dressed in very warm clothing I went outside (along with my brother) and began to shovel. After I had finished shoveling the path to our back door I went to go see how my dad was doing. I then found out that the snow blower was broken (or something like that...it wouldn't work...that's all I know). Needless to say I started to help him shovel our driveway. Once we had finished shoveling our entire backyard we started on the front (me doing from the beginning of our path to the stairs, my brother shoveling the veranda and my dad shoveling from the backyard to the front yard). Once we had finished with those jobs my dad began making a path in the snowbank in front of our house. He was using an icebreaker (not the gum mind you) to do so and he only had one so he sent my brother and I inside. Later, my dad came inside and thanked us both and I told him to "pay it forward". He just nodded and said okay (he probably assumed that I'd tell him to pay it forward). So you see, anybody can make a difference in the world. All you need to do is give a little of your time to help somebody out. In this way we can all make a difference, especially if you tell the person that you helped to pay it forward and they tell the person they helped to pay it forward. In this way, that one little thing that you did adds up and makes the whole world a better place for everybody to live in. Thus, I encourage anybody who reads this to do at least one random act of kindness and to "pay it forward". Borock Obama: Hey, i'm borock Obama. Bob: May i ask you a question Borock Obama. Borock Obama: Sure, I guess, but what is the question about ? Borock Obama: negative 6n+15 . Borock Obama: How so ? Bob: The first "n" means positive 1, and the second "n" is negative 5n. The positive and the negative integers cancel each other out leaving negative 4n . Canceling out the positive integer and the negative integer was your mistake. Borock Obama: I see. Give me another question please, i'll get it correct. Bob: okay, 2 + 4 bracket 3n+8 bracket . Borock Obama: 12n + 10, i'm sure of it. Bob: That's wrong again, the real answear is 6n + 32. Borock Obama: How , i was so sure it was 12n + 10 . Bob: You didn't use Distributive Property. Borock Obama: Well i have to leave now , BYE ! Bob: Nice talking to you Borock Obama. Bye ! Julia: What do you think of my new uniform? David: Quiet Julia I'm working. Julia: What are you working on? David: I'm trying to figure out these algebra questions I think I`ve got the answers. Julia: Well then, let me check. David: Fine, the first question is n+3-5n+12. My answer is -6n+15. David: Really! How`d you get that? David: Thanks Julia. The second question is: 2 + 4(3n+8), I got 12n + 10. Julia: Well David, I guess you didn't listen in math class, because I think you're wrong again. David: What do you mean? Show me. Julia: Well first you do the you combine like terms like this 2+4(3n+8), 6(3n+8) then you get rid of the brackets by multiplying both the terms inside the brackets by six so you get 18n+48. David: Wow thanks Julia, oh and nice uniform Julia. Lara-Hello Jackie ! How's it going ? Jackie-I'm doing good ! And You ? Lara-Oh man ! I had soo much fun at school today ! Jackie-Really? Why was it soo fun ? Lara-Because we learned about Algebra ! Didn't you take that in school today ? Jackie-..I don't know.. I don't pay attention in school..
Lara-Well, anyways.. I should teach you , it is quite fun to do ! Jackie- Okay.. fine! But I hope it is fun ..
Lara- Oh don't worry it will ! Lara-Okay, our first question is n+3-5n+12 ! Jackie-Okay let me think... hhmmm..
Jackie-well.. I think it is 6n+15 ! Lara- Haha , nice try Jackie , you were very close ! You see , -5 + n = -4 and 3 + 12 =15 .. so the answer would be -4n+15 ! Jackie- oh .. wow you really know your math huh ? Lara-Okay let's do another question ! Jackie- uhm .. Isn't 12n+10 ? Lara- What you would do is ,4 times 3n is 12n. Then 4 times 8 is 32. 12 and 32,bring 2+ which is now 2+12n+32, then add 2+32 is 34. So now the question is, 12n+34 ! Jackie- WOW ! Very good Lara ! Thanks alot for helping me out.. Next math class I'll sure pay attenton thanks to you ! Here are my pictures to explain how to solve additive, subtractive, multiplicative, and divisive algebra questions ! Men in Black Guy : HEY YOU !!! Men in Black : I think I can prove you wrong here look give me a random integers question. Men in Black : HAHAAAAAAA NOOOB simplified is -6n+15. Men in Black : ohh i see my mistake well this one i think im flawless on it. Ninja : how did you get that? Men in Black : well I x the 4 with the 3n and that = 12 n and then I x 2 and 3n and thats 6 and added the 4 to it. Ninja : well I think it is 18n + 48 because 2+4 = 6 and then You x both the 3n and 8 by 6. Men in Black : well lets leave it to other people to decide everything. at times it can be hard. dealing cards will no longer be a jinx. how many 2's are in 6 equally ? the answer to this question is 3, obviously. your product is a negative. your product is a positive. Today in class our assignment was to correct our tests that we had yesterday. Here are 5 of the questions that I had problems with. What I did was first I grouped like terms. I did 9a-4a and the answer I got to that question was 5a. Second I added a five to positive 5a. So when you do that your answer would be 5a+5. The first thing I did to get the simplified answer was multiplied 5 by 4. When I did that I go 20x, then I multiplied 5 by 6.I got 30 when I did that. So I had 20x+30+3x. I added the like terms, which gave me,23x then I brought the 30 down. The simplified answer would be 23x+3o. Since NO ONE is doing the scribe I will. Because we never had a scribe for the past few days. Anyways, today we had a Math Test. I'm going to be answering some of the questions from the test. To answer this question you will need to change the "Uh ohs"
then combine like terms and add them together. A number is divided by seven and then decreased by nine. Six less than a number divided by 4 is 25. These were some of the questions on the test. Sorry, anyways there was no homework. thingy. Its due on December 19th. Today in Math class we learned about distributive property. We use the distributive property when we are multiplying more than 2 terms. 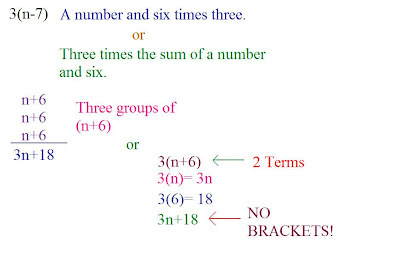 Multiply each of the terms inside the brackets by the number outside the brackets. Here are examples that we did in class with Mr. Harbeck. Here is the last example that we did in class. Here are the questions and answers for p.7 in the pink booklet. today we learned about distributive property. We used distributive property when you multiply more than 2 terms. Swiper: wait.... do you even know what algebra is? Swiper: do you know n+3-5n+12. If you need my help all you do is ask. Boots: Is it... -6n+15, I think thats the answer? is it? Swiper: No thats wrong but nice try. Circle the variable then combine like terms so its easier. Now simplify the question. Also n just means the number 1. sometimes you have to do it step by step. Soo.... What's n-5n? Swiper: yes thats correct. How about 3 +12? Swiper: put them together and you get?? Boots: Thank you very much I learned many things. Ill see you later byee. Swiper : No problem anytime. And keep in touch. How many equal parts are in 5 go into 10? When you look at your barn doors you'll have an answer! after you know this you’ll be ready for combat. It`s so easy when you try. Today in class we learned how to simplify equations with many variables. Mr. Harbeck taught us three steps to simplifying these kinds of equations. He also gave us homework but I’ll explain that to you later. Now our homework for today is on page 6 of the pink booklet. I will do 5 questions for you from the top left corner box. Hope you guys enjoy my scribe. The next scribe is Avery Medina. According to Ron when you multiply an odd number of negitive integers your product will be negitive, And when you multiply an even number of negitive integers you will get a product that is positive. lady-I'm good but im having trouble with my math homework. man-I can probably help you. lady-okay...the first question is n+3-5n+12. man-hmm..i think the answer is -6n+15. lady-I don't think that is correct.The real answer is -4n+15 because you take away 1n to 5n which gives you 4n and then you add 3+12=15 thats how i got 4n+15. man-good job i think i need to do more studying. man-okay let me try this one...hmm the answer is 12n + 10.
lady-no, wrong again the answer is 18n+48 because 2+4=6 then 6*3n equals 18n and then u multiply 6*8 which give u 48...thats how i got the answer 18n+48. many are in each group"
Now let's take the time and ask what's 6 divided by 2? By making a picture, we'll be sure to get it right. "That wasn't that hard I suppose..."
Multiplying integers, multiplying integers,what could that be? adding is one thing and subtracting is another. so it's time to take action and figure it out. low, but the answer nowhere to be found! Blew, but how could that be, when I'm inside a room! I closed my eyes hoping it's a dream but it's reality to me! an odd number of negative integers the answer will be odd. Negatives make a difference to all!" Shiki: Oh really? Let me see it. I might be able to understand it. Shiki: You dummy...This is so simple! The answer is -6n+15. It's so obvious! ??? : That's wrong! That's wrong! Your the idiot around here! So stupid! What a dumb mistake! Kai: Uh... Who are you? Shiki: Who are you calling an idiot! Go away you old hag! This is none of your business. Shiki: But it doesn't look like it... You're lying aren't you? Shiki: See you ARE a liar. The people around them: SSSHHHHHH!!! Kai: Um...Airi... You said that Shiki was wrong before...How come? Airi: Ha! You're wrong! It goes like this! The question is n+3-5n+12, right? So then n+-5n=4n because n represents 1n. So a positive 1n then take away a negative 5n equals negative 4n. See? Then 3+12=15 so the answer is -4n+15. Airi: Who has the brains now, I-DI-OT! Shiki: Not in a million years! Who side are you on anyway?!?! Airi: You're the one who should shut up! Airi: Why? Because you're an idiot. You're going to make your friend an idiot if you keep talking! 2+4(3n+8)... Do you guys know the answer? Airi: ! I know the answer! Shiki: I know it, too! It's easy! really! Shiki: Well the question this time is 2+4(3n+8) and this time it has those annoying brackets... When you have brackets you multiply... So you take the number in front of the bracket's which is 4 , so you multiply 4 by 3n. 4x3n=12n, right? Then you multiply 4 by 8. 4x8=32. So the answer would be 12n+32. Kai: Wow! That's a good explanation! How about you Airi? Airi: ... I got a different answer... did I do something wrong? Shiki: Well of course you did, idiot. Airi: Shut up! I don't need your sympathy! Kai: So what did you get? Shiki: Ah ha! You forgot to multiply 8 by 4! That was your mistake! Who is the idiot now? Airi: Shut up! Shut up! Shut up! Airi and Shiki: Not with him/her! Not in a million years! Kai: (sigh) Well it looks like it... Don't you think so too? SORRY! I didn't know that you could only do 2 people only... I was kind of lazy to change the script so please don't get mix up that the people change. Their short clips so I hope you enjoy it. 4 groups when we have 12 ? Julien drew 4 groups onto a paper. So Phill get another piece right ? Yes now that sounds about right. Know you know you are right ! How many parts of 5 fit into 10? when we do quotative Division. dose the top fit into the bottom ? sometimes there's a left over. Just so we can share. Timmy could not figure it out. How many times dose 5 fit into 10 ? your product must always be a negative. Your sum must be a positive. You will really be great ! Here is my script, for chapter 2. Jobelle: Hey me and you are still having friends over right ? Nick : For sure, I cant wait. All of us friends, just hanging out and having a good time. I'm excited. Jobelle Lets make this interesting, are you down for a bet ? Nick : Bring it on! You know that I am all ways going to win, so beating you again, i don't know why you all ways try. But I'm in the mood, so bring it on little Jobelle Bell ! Nick : I already know I'm going to beat you , what do we have to do stay in a pool of cold ice for 5 minutes ? Jobelle:No, stop being a fool, so we have 2 questions that we have to solve, math questions. Nick : HA maybe you might beat me you nerd. Yeah right, in your dreams. Jobelle: Okay so we have 5 minutes each question and who ever is right can just hang out at the party and get served like a king by the loser. Nick : Dude I am already a king, but hey, getting treated extra special would be even better. Jobelle: Yeah I wouldn't be so cocky if i were you, Nick. Nick : Okay so when are we doing this ? Jobelle: When do you want to do it ? Nick : As soon as possible, Because truly I need a back rub. Nick :Easy, as b-boying for me. Jobelle: Just be quite and do it. Jobelle: Okay well I am done! Nick : Well I have 6n+15. So dude, who is right ? Nick : Well I have 6n+15. My steps were n+-5n, and that gave me -6n then i added 12 and 3 together and i got 15. so that's how i got it. Nick: Well I am done now ! My answer is 34+18n. Jobelle Well I have 12n+10. Nick: I am confident about this one so ill explain first. Well first I did 2 multiplied by 3n and I got 18n. Second I did 4 multiplied by 8, and when you do that you get 32. Then you just bring down the 2. So now I grouped like terms and I got 34+18n. Jobelle: Well I got 12n+10 because I multiplied 4 by 3n. Next i added 8 and 3 together. So that gave me 12n+10. Nick: No you are wrong. 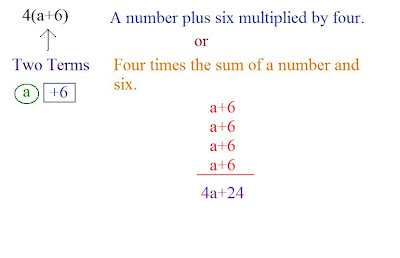 You have to multiply both, 4 by 3n and 4 by 8. Then you would have to just bring the 2 down, and then group like terms. Jobelle: Okay. So I guess its one Jobelle and one Nick. So what are we going to do ? Here is my video, I hope you like it.